It seems there is never a good time to begin eating healthy. We all know the pitfalls of trying to eat healthy during the winter holidays. The summer time, with all the wonderful fresh food, should be an easy time to embark on healthier eating. Unfortunately this too is a frustrating time for clients; Mother’s Day, Memorial Day, Weddings, 4th of July, Family Reunions and finally, Labor Day all create a parade of unhealthy weekends! 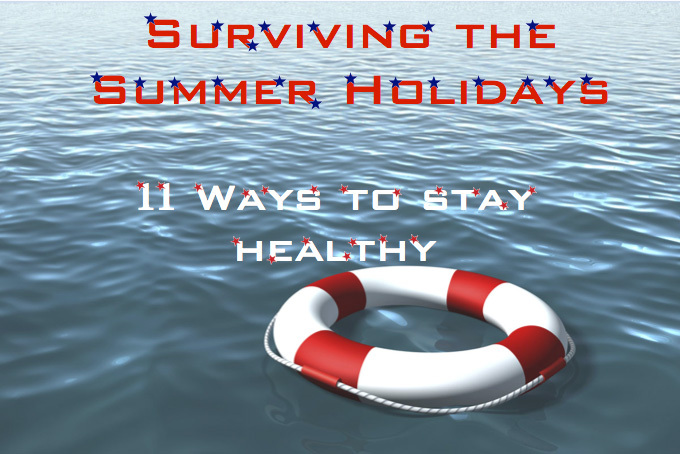 Here are 11 things to help you stay on track and even progress during the FUN FILLED SUMMER. Monday is your start to a new week. Life is too short to berate yourself for all the weekend indulgences. If you think about your past weekend, do it with gratitude for the people and events. Focus on the FUN and FAMILY, not the food and drinks. This is the day to get back into your routine. Drink charged filtered water as your only beverage for the rest of the week. Change it up. In your “to go” water bottle you may want to put just a pinch of Himalayan salt. When you are at home you can drink from your pitcher filled with herbs, citrus, ginger and cucumbers. The exception is the occasional coconut water after physical activity. Parsley, Ginger and Lemon. Try to incorporate all three somewhere in your daily nourishment. All can be put in your smoothie or charged water. A few parsley leaves on your salad and a bit of lemon juice in the dressing are easy options. Drink a tonic of warm lemon/ginger water. Do not deprive yourself. Make a delicious sorbet or fruit/veggie popsicle to enjoy on a warm evening. This is especially nice if you have children. (This link has two sorbet recipes. Keith likes the ginger peach and I like the raspberry. However, once you get the hang of it, the options are limitless). Take ALL your supplements. Whether you are recovering from a weekend or preparing for a weekend, now is the time to stay on task. Taking all your supplements as often as recommended will help relieve STRESS on your system. It will give you more resources to function at a higher level and possibly nutrient reserves. Rest your body from animal protein. Take a day or two and eat only plant based proteins. No meat or cheese in your salads. This includes dairy, poultry and fish. Add hemp seeds, pumpkin seeds and/or goji berries to your salad and smoothies. Make a chia pudding or smoothie. Eat a tahini based dip or sauce; Raw Pad Thai is a favorite. This recipe is good as a pasta sauce, veggie dip or a spring roll dip. Share the wealth. Take your healthier habits to the holiday party! Take a beautiful glass jar of fruit and herb infused water for all (and you) to enjoy. Make a nutrient dense dip or hummus and pair it with veggies or use endive to scoop as a dip. Bring the SALAD (this is what my family has me bring) with homemade dressing on the side. End the weekend well. Drink your ACV tonic every night if possible, but definitely drink it once you’re home and at the end of your holiday. If you are a fermenter, eat a little fermented food before retiring. Focus on belly breathing before you fall asleep; breath in, belly rises and breath out, belly pushed down. Deep breathing will help detox through the lungs, push the lymphatic system and relax you for a better sleep. MOVE! Walk, ride your bike or just take 10 minutes every morning to MOVE YOUR BODY. That being said, we tend to OVER work out to try and make up for a poor diet. This is usually a bad strategy in that a poorly FED body is stressed. Adding intense workouts will stress the body more and may create cortisol. Cortisol is a stress hormone that may cause you to gain weight, retain water and crave sugar. This entry was posted on July 22, 2015 by thrivecoach12 in Thrive vs Survive Articles and tagged Nutrition, Nutrition Fairview Heights, Thrive vs Survive, ThriveCoach Fairview Heights.